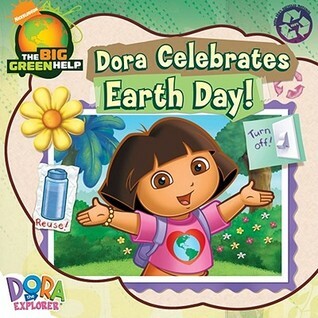 This Earth Day holiday book features Dora and her friends, including Diego, doing various things for the environment. The tips aren't anything new (turn off lights in room, use reusable bags at the grocery store, bike instead of drive, etc. ), but may be new to a young audience. At the end of the book, everyone meets at Play Park for an Earth Day Party.The illustrations have a 3/4 page main picture on the left page and collage-like pictures on the right page which include examples of characters being environmentally friendly and, on some pages, spaces for readers to brainstorm their own ways to be green.As a literacy specialist, I wonder who the intended audience is for this book. Dora is supposed to be around kindergarten age, but the writing and vocabulary in this book is well above the reading level, and maybe attention level, of similarly-aged readers. Also, unlike some of her other stories, it doesn't have any Spanish words other than "hola." A little wordy, and it's different from her usual books in that it doesn't have a typical 'quest', but this has helped my daughter to understand about closing the fridge door instead of leaving it open "because I like to". Of the books in this series, I found this one most helpful for young ones to understand the importance of protecting our planet. This book was not overly wordy and it perfectly illustrated age-appropriate activities that children could do to help the Earth. I like the part when they were all wearing flowers. I turned off some lights after reading this book. The children really liked this book and it gave them simple ideas of the way that preschoolers can help save the earth.